8 hours drive from Chicago away, there is the city Minneapolis at the middle of the State Minnesota . The 8th Christmas Cantata was held at the Minnesota State University Minnesota is famous for its river Mississippi that is the setting of the American traditional children’s book “The Adventures of Tom Sawyer.” Right at this place, the Gracias Choir has brought even greater fascination to the people than the “The Adventures of Tom Sawyer.” Minneapolis is a place with strict public safety laws that made it more difficult for the distributing of handwritten letters or flyers. That is why we sought for the support by the responsible public officials if short for one week and long for even a month, and we were approved by 36 different districts. The invitations to the Christmas Cantata in the form of handwritten letters were spread out to each household and apartment. The seventh performance of the Christmas cantata U.S. tour took place at the Rosemont Theater in Chicago, the city of skyscrapers and the third largest city in the United States. The Gracias Choir takes 3,600 audiences to 2,000 years ago in Bethlehem on their first stage. “I came to see the most beautiful performances in the world. This performance is definitely a world-class performance. The first time I saw this performance was at Evanston about eight years ago where they performed for two years. Then after that was at Northbrook, just a little away from Chicago. I arrived at 6 o'clock, 1 hour before the performance, but I had to go back home because they were already full. The faces of the audience were full of happy smiles as the Cantata ended and they were able to go home with strong emotional resonance. The 6th of gracias choir U.S Christmas cantata tour in 2018 is the Indianapolis city which is the shrine of motor sports in the U.S. The Indianapolis has a long history and it is a famous city of the car races call “Indy 500”. The “Indy 500” has open on May 30th every year in Indianapolis motor speedway and this race is a biggest race in a day. The Christmas cantata happened in Indianapolis with the autumn. Gracias choir had prepared to Christmas cantata and 100,000 invitations was delivered to each person, family in Indianapolis. Also, over the 40,000 students had invited to happiness of Christmas on autumn at the day of the evening. September 24th in the evening, the weather was rainy with the autumn instead of a snow and a white Christmas. 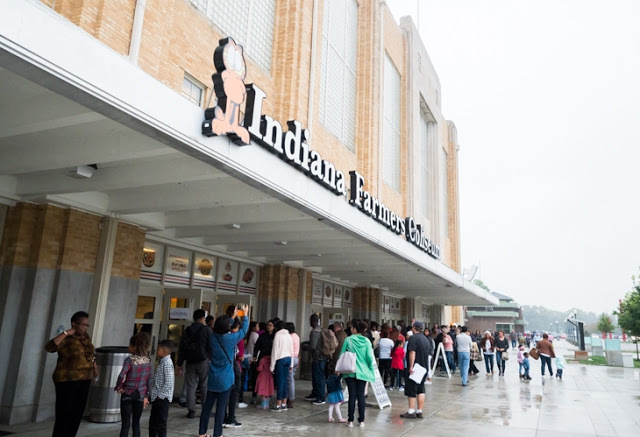 2 hours before the concert, people came to Indiana farmers coliseum one by one and everyone had an invitation of cantata on their one hand and the other hand had an umbrella. Finally, 3,500 seats were packed. At the evening of the Christmas cantata concert in Indianapolis was touched peoples’ hearts with a lot of happiness even all things can’t touch their hearts from this world. When cantata concert goes over and over, the withdraw of cantata concert speeds going to be really fast. Even actors and actress helped to staffs to withdraw the cantata concert from the hall. After Toronto concert, gracias choir was moved to 5th city Detroit in Michigan. Detroit city had a fell apart of the car industry that it destroyed a reginal economy and people are left. This cantata concert visited to Detroit 8th in this year. Masonic Temple is the second biggest hall in U.S and it is freemason temple which is a largest in the world. This year, the volunteers gave 180,000 handwritten letters to Detroit people much more than last year and they also gave it to people in Hispanic village and east slum which is 8 miles away from the center of the Detroit city. It is really dangerous to go to the slum and even black people avoid to going there. Mr. Daeil Noh, who is a leader of volunteers, he went to an apartment in some village which is a bit better than the other villages due to pass it on to people about the cantata concert. In that village, people had a smoked weed and they had some beer or liquid on their hands. Even though, children were just hanging out naivety. When the sun goes down, the black muscular men were surrounding him. Even he had fear about them, he gave handwritten letters to them and talked about cantata concert. Meanwhile, their attitude just changed with no reason. The volunteers were expected about 4,400 seats will packed and passed it on handwritten letters to people. In result, the handwritten letters brought a lot of Hispanic people. In the past, usually black people came to the cantata concert in Detroit, but this year’s cantata had a jump over a racial barrier and the gap between rich and poor. The Detroit city is still in a recovering their economy and they have a goal to rebuild as a wonderful Detroit as a past. We believe that Detroit will be the best city for living in the near future due to dream of hope to the cantata. The fourth Gracias choir U.S Christmas cantata tour was continued in Paramount Fine Foods Centre, Mississauga. The paramount find foods Centre is a huge hall as it can accept around 7,000 people and the Mississauga is a popular spot and the high population satellite city of Toronto. The Gracias choir started to prepare for cantata concert certainly when they arrived to Paramount Fine Foods Centre at 7:40 am as same as last concert. The process of practice and dress rehearsal are very important for more beautiful and perfect performance in harmony between music instruments on the stage even all parts of a concert are the same. The cantata concert in Toronto, Byeong Jo Kim belongs to the Nation Dance Company of Korea, he met gracias choir and coached their dance and also, he was the main actor to the several concerts. Before this cantata concert, a lot of people donated to gracias choir who works on musical concert for people and they impressed about purpose of the cantata. Joongang and Hankook news, they put a full-page advertise about the cantata concert and one native Canadian mentioned about “I have a work for save money only for me but I would like to support to gracias choir” and he donated some rice, snacks, juice and noodles. 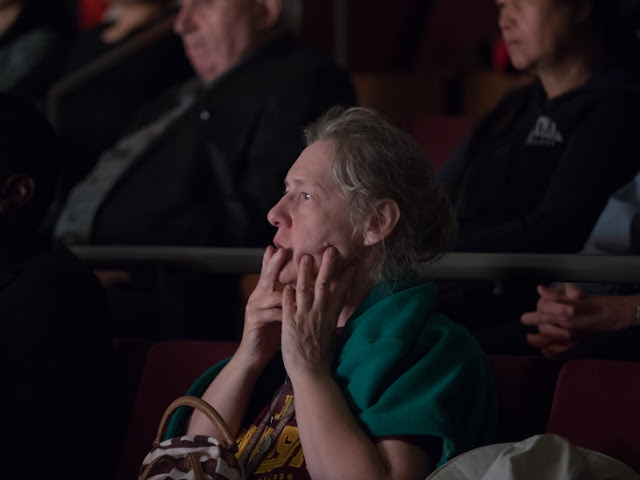 Also, when people watched the gracias choir cantata concert, it touched people hearts at the day of the evening in Toronto. 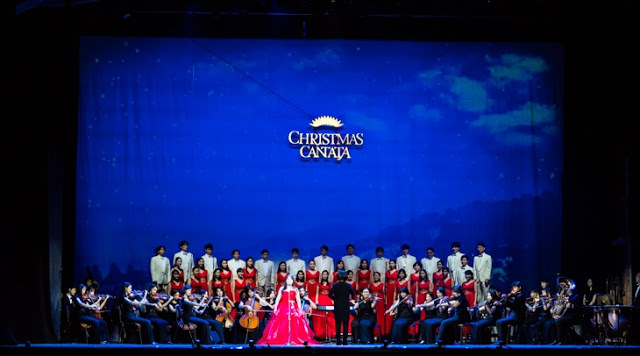 The Christmas Cantata went on at the venue in the Temple University, Liacouras Center, located in the heart of the city with a capacity of 7,000 people. We further informed people about the Christmas Cantata in an interview on the Philadelphia News, NBC 10, and the anchor, Tracy Davidson, uploaded an interview separately on her Facebook page that informed people about the Christmas Cantata. Baby Jesus’ cry that could be heard in Bethlehem 2,000 years ago, when no one accepted Mary, Jesus in her womb and Joseph. To those who have forgotten Christmas due to their busy works, the heartwarming musical has brought back the love of the family and of Christmas that is gradually passing into silence. “The venue was so great. I enjoyed every single moment. I cried and laughed. These were unforgettable moments for me. I really enjoyed it. 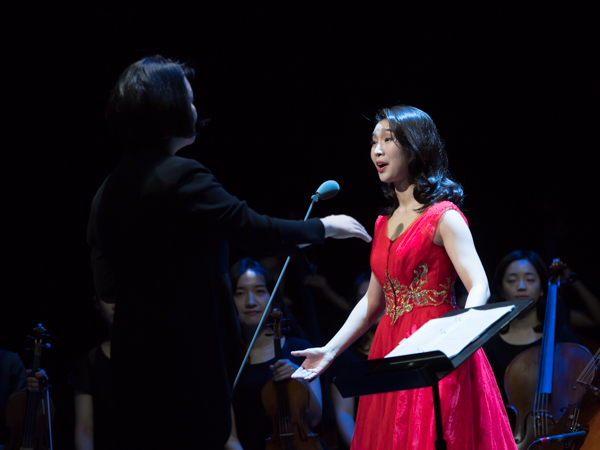 I hope that everyone comes to enjoy this Christmas.” – Nadja / Student of the Temple University / Russia The last stage of the Cantata, Soprano Jinyoung Park’s ‘God Bless America’. 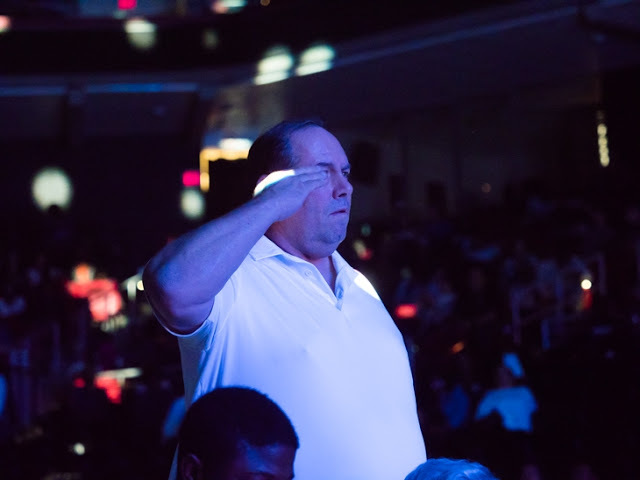 Rock Bradon, a retired former soldier, quietly stood up and raised his hand in salute to his beloved fatherland and to God until the end of the song. The second city of the Gracias Choir Christmas Cantata U.S. Tour is Fairfax, located in the southwest of the United States capital, Washington. 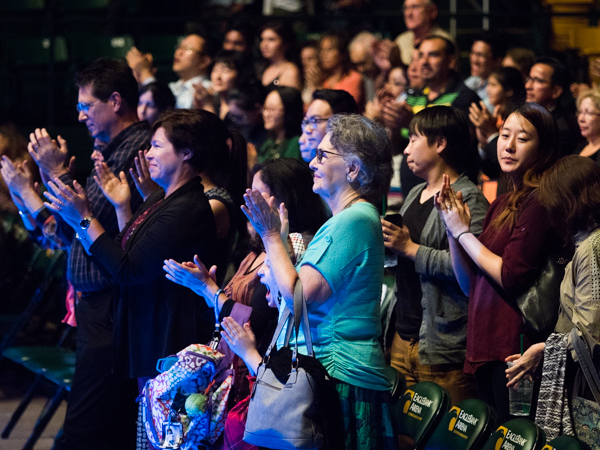 Early in the morning, the Gracias Choir staffs began to unload and set up the stage at the Eagle Bank Arena on the campus of George Mason University, everyone is hard at work on their parts. As soon as the choir arrives at the venue, they immediately divided into different parts for choir practice. This year, 100,000 flyers were given to the students and citizens to promote Christmas Cantata on campus, and 100,000 handwritten letters delivered to the residents in each house. 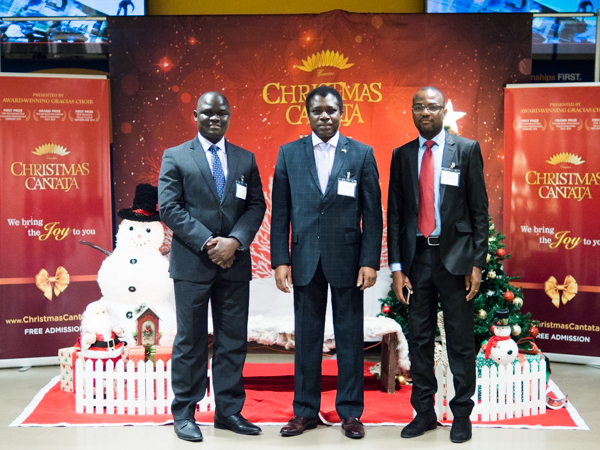 The PR team also visited 600 churches in Virginia to invite them to the Christian Leaders' Fellowship that started because of Christmas Cantata. This seed of hope has arisen the hearts of the citizens and filled the 5,000-seat hall. Heavy rain and storm drains were predicted to affect Fairfax but the beautiful performance of the Christmas Cantata and its powerful message has chased away the storm. 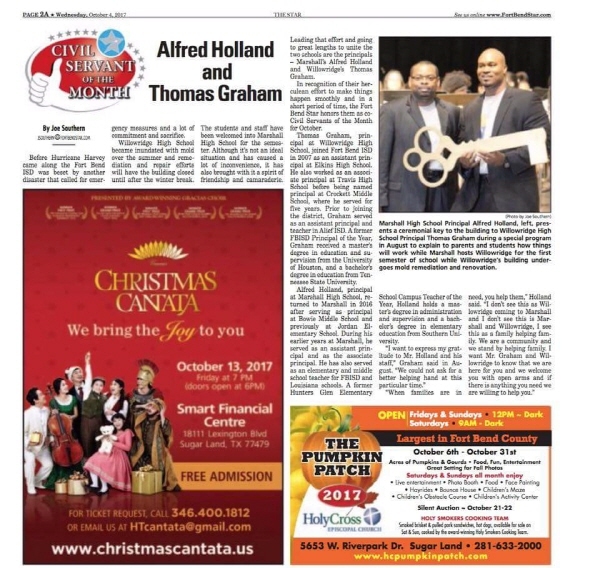 The first city of gracias choir U.S cantata tour just launched in Newark, N.J, which is most high population (280,000) among the satellite cities of New York. 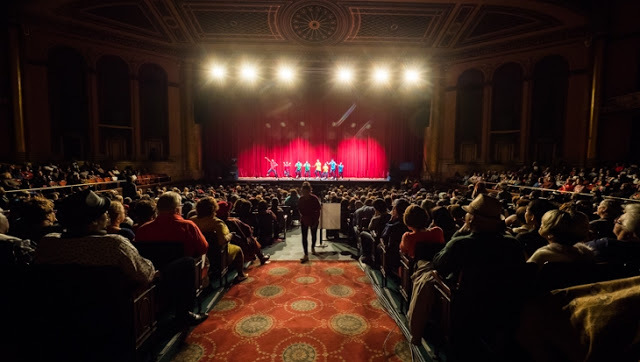 The Newark NJPAC theater that gracias choir cantata concert launched has the modern and high-class appearance and it also provide 3,500 seats to people. This year, cantata is the third concert this year and 3,500 seats was packed in NJPAC theater even last two years. This cantata is about remember Jesus birth and truly meaning of charismas in act 1, to show you that even he had a poor life, he sacrificed for people whose he loved in act 2, gracias choir whose had an approval of number 1 choir in the world is showed greatest orchestra and singing in act 3 and also, they give to people the message of his loves. New Jersey people had an impressed, thankful and biggest happiness while they are watching this cantata and it fully touched their hearts. ★ City: New Orleans is one of the major port cities in the United States and the largest city in Louisiana. As of 2010, it is the 46th largest metropolitan area in the United States. US Cantata Tour's twenty-first city, New Orleans, where the scars of Katrina from 2005 still remain. "I have attended the Cantata for the third time. It is even more touching every year. I can not forget the peace and how moving it was the day I first saw this Cantata two years ago. That is why I wait for this Cantata every year." The performance and message conveys light and happiness to the hearts of citizens in despair. Perhaps that is why most of the audience are fixed fans who wait every year for the Cantata in New Orleans for the seventh year now. "I attended the second time this year. I received my first Cantata letter three years ago. But I did now receive one last year and the year before last and you don't know how glad I was to receive the letter six weeks ago. It's the best performance ever. Please come again." The Christmas Cantata of the Gracias Choir contains love so the citizens gain peace and hope in their hearts by watching it. Cantata is becoming new hope for the New Orleans citizens. City: Houston is the largest city in Texas, the fourth most populated city in the United States with an area of 1,600 km². The Houston Ship Channel is connected to the Gulf of Mexico and is the "ocean-free port" and the No. 1 port for exporting cotton in the United States. It is rich in petroleum and produces synthetic rubber, machinery and so on. It is famous for the space center of NASA. Houston is the fourth largest city in the United States with a population of 2.1 million, and more than 617 million combined with the population of nearby satellite cities. But with the recent hurricane, Harvey, many citizens have lost laughter in their lives. 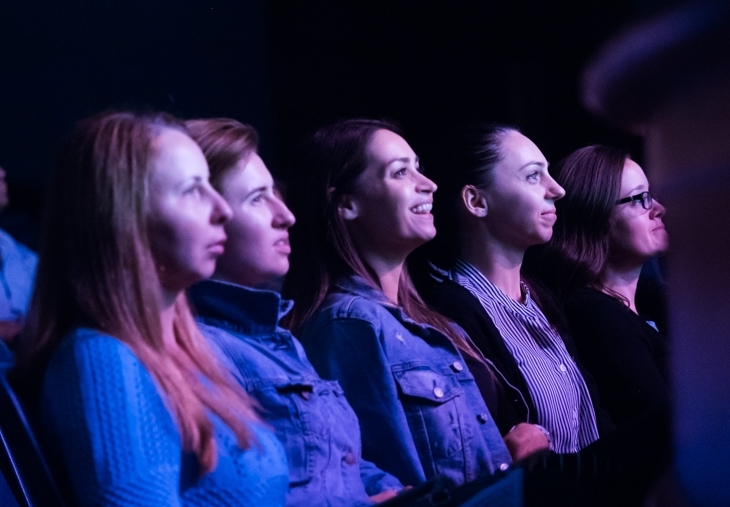 The Cantata held at the Smart Financial Center in Sugar Land, near Houston, provided joy to these citizens with a performance from the heart of the Gracias. "It's more than I imagined. The voices of the members were so beautiful, and the costumes were really lovely. My ninety-three-year-old mother has lost everything in this flood. So now she lives with me. If I had come with her today, she wouldn't be able to listen to the music because she has poor hearing, but she would have been pleased just to see the smoke and costumes of the Gracias Choir. " 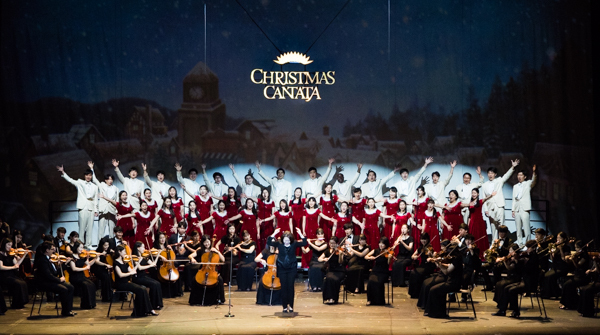 The 3,500 citizens who attended the Cantata concert gave warm applause and cheers and spent time in hope and joy. The happiness index of Indianapolis people is the No. 1 in the U.S / 2018 Gracias Choir U.S Christmas Cantata Tour # 6 Indianapolis I.N. This concert, even it touched a man's heart towards unforgettable his motherland / 2018 Gracias Choir U.S Christmas Cantata Tour # 3 Philadelphia P.A. Detroit city has a dream of rebuilding that wonderful Detroit with the Christmas cantata / 2018 Gracias Choir U.S Christmas Cantata Tour # 5 Detroit M.I. Who is the Gracias Choir?